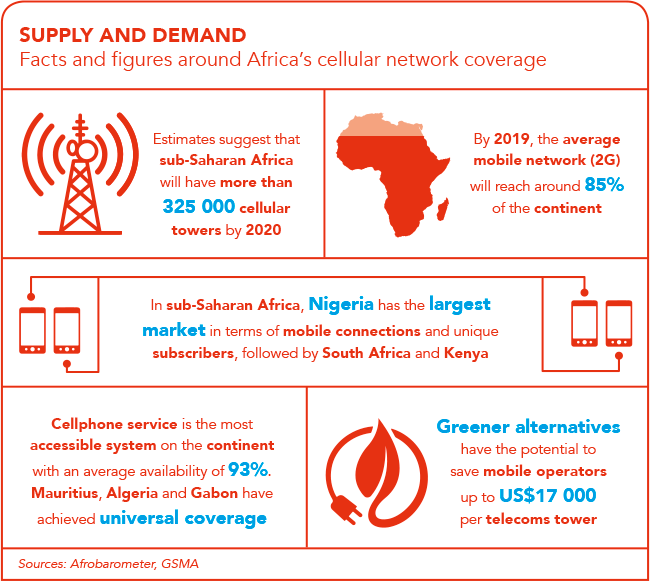 With the rapid growth of the continent’s mobile connections, operators are turning to sustainable ways of powering telecoms towers amid a roll-out of faster networks. Picture the scenario. The power goes off suddenly, leaving you in the pitch dark. The first thing you feel around for is your mobile phone. You switch it on but the panic doesn’t abate as you struggle for reception, regardless of where you direct your phone. Two bars… One bar… Nothing. While smaller base stations generally have uninterrupted power supply – making this situation more unlikely – traditional telecoms towers need around-the-clock access to electricity to work and for people to, well, use their cellphones. Let’s take South Africa, for example. Last year, the country experienced frequent power outages, and while it may not have interfered with mobile networks too much, concerns about a complete national blackout still hung in the air, bringing into question how telecoms networks would cope should there be one. According to a MyBroadband report, many of the country’s network companies weren’t that concerned about the implications of a national blackout. Vodacom, one of South Africa’s most popular networks, says that nearly all of its 10 000-plus base stations have some form of battery back-up, capable of lasting up to four hours. Meanwhile, MTN’s network is designed to be self-sufficient in the event of a power outage. Neotel’s Points-of-Presence and Mega Pops services have battery and generator back-ups that can withstand an outage of up to four weeks. Telkom’s core network sites have sufficient back-up generation capability (thanks to extended battery capacity as well as back-up and mobile generators), while Cell C is able to operate completely off-grid. That’s all fine and well, but bear in mind that these back-up generators (or off-grid sites) run on diesel fuel – and therein lies the problem. For one, diesel-run towers can be a costly affair, says the GSMA. It estimates that an off-grid site can consume nearly 13 000 litres of diesel every year (never mind the 25 metric tons of CO2 it spews into the atmosphere), costing mobile operators an average annual energy opex of more than US$21 000. David King is CEO of Flexenclosure, a developer of intelligent power management systems and pre-fabricated data centres. He believes operators could save up to 20% of their total costs if they let go of diesel – freeing up capital to expand their footprint. ‘No other practice in the mobile telecoms industry is more environmentally harmful than powering several hundred thousand off-grid base stations by burning diesel fuel, and no other practice is more financially onerous for mobile operators. ‘For many operators in developing markets, energy is the single-largest cost item – often representing as much as 50% of total operating costs,’ he says. Therefore, to reduce the cost of energy in powering tower sites, mobile operators across the continent have adopted the renewable energy route. Solar is one of the most widely available sources of clean energy, and dominates as an alternative to diesel because of cost. It should therefore come as no surprise that it’s the most widely used when it comes to green telecoms deployments in Africa. Currently, there are just under 4 000 sites (almost all of which are off-grid) stationed with renewable alternatives, and solar accounts for nearly 90% of them – making it the only technology that has reached a stage of commercial adoption across the continent’s markets. 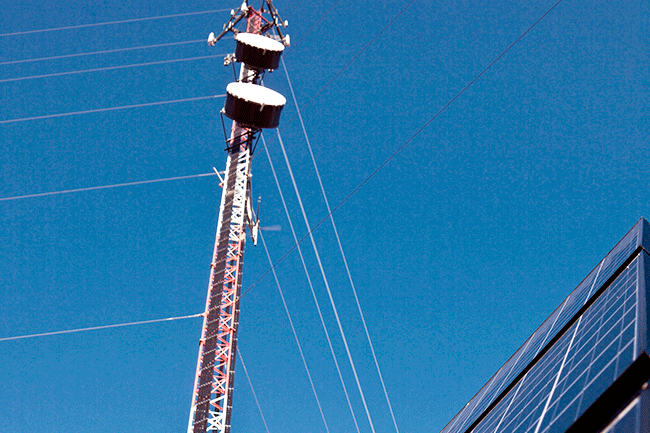 One of the companies active in deploying cellular towers using renewable energy is Nokia Networks. In 2012, the telecoms equipment firm (formerly known as Nokia Siemens Networks) repurposed a Vodacom cellular tower in Durban, South Africa to run on a mixture of clean energy instead of via a diesel generator. Now it draws energy from 10 solar foils mounted on the existing tower (each of which deliver 300W peak power), a vertical-axis wind turbine at the top (performing nominal output power of 3kW) and deep-cycling batteries that operate at a fixed temperature to store any excess energy. Ericsson is also a major player in developing technology to fill the gaps in connectivity. In East Africa, it has designed a hybrid solution that combines solar panels with batteries and a smaller generator to secure the site’s energy supply, reducing its dependence on diesel. Meanwhile, in a bid to address energy challenges faced by Huawei’s African operators, its new-generation telecoms power solution focuses on three levels of efficiency, setting a good example with its monitoring-intelligent software (which is implanted into each battery cell). The software provides technicians with data regarding battery cell capacity, removing the need for them to go onsite, which in turn reduces the operational costs associated with physically visiting a site. Another way in which telecoms firms are reducing diesel use is through tower sharing – which, according to World Wide Worx MD Arthur Goldstuck, is ‘a way of expanding infrastructure at a much faster rate than increasing investment’. He adds that some companies adopt this method in order to also operate more efficiently, make better use of automation and demand planning, and embrace new technology categories, for instance cloud computing and big data analytics. One of the biggest companies active in tower-sharing is Helios Towers Africa. It has in excess of 5 500 towers spread across four markets, and recently secured funding of more than US$95 million through the Standard Bank Group, which the company will use to expand its towers across Tanzania. Meanwhile, IHS Towers – which owns around 23 000 towers throughout Nigeria, Cameroon, Côte d’Ivoire, Zambia and Rwanda – has pledged to convert 90% of its 900 shared towers in Nigeria, enabling them to be powered by solar energy, which will reduce their annual carbon emissions by 24 000 tons. While network operators are working tirelessly to ensure their towers have renewable energy alternatives, they’ve done so without compromising network speeds and coverage. Ericsson Ghana country manager Ignacio Gelso says operators are become increasingly cognizant of the need for 4G services to ensure their offerings are competitive. Again, Huawei ticks that box. At the AfricaCom conference, held in November 2015, the company introduced two of its latest initiatives: the Lampsite Partnership with mobile operator Cell C (which was launched in South Africa to enhance indoor network coverage and capacity of users in shopping centres around the country) and its Green Energy Solution. Meanwhile, last year Nokia Networks was selected by Safaricom to expand its 2G and 3G network infrastructure in Kenya and supply its Single RAN Advanced platform based on the Flexi Multi-radio base station. The two companies also teamed up for the launch of the East African country’s first LTE-Advanced (4G) network at the end of 2014. More recently, in May this year Ericsson partnered with Airtel Nigeria in a countrywide implementation of its radio system platform. The system can adapt to any site, with zero floor footprint, while reducing both operating and capital expenses as well as delivering three times the capacity density with 50% improvement in energy efficiency. This increases affordability of today’s 3G technology, while also laying the foundation for the 4G and 5G evolution.